Not for: Those who don’t like dogs. There are a number of friendly ‘house’ dogs who love to lie amongst the yoga mats during a class. 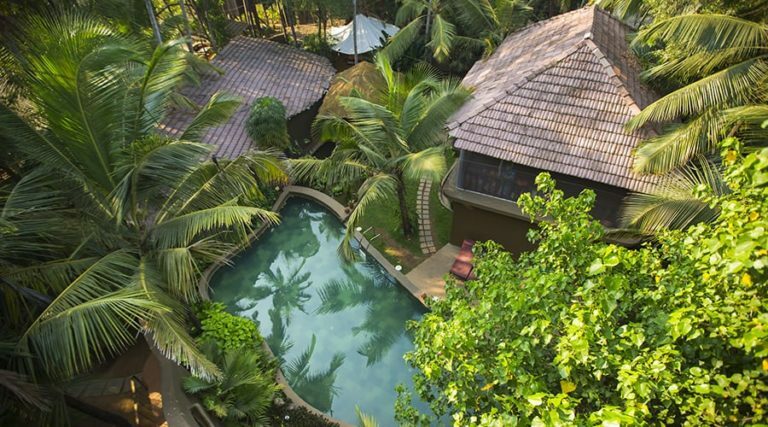 Hidden amongst the palm groves just off Mandrem Beach in the North of Goa, Ashiyana (which means ‘home’ in Hindu) is a quiet gem of a yoga retreat far from the hustle and bustle of the rest of Goa where you can unwind, indulge in a fantastic array of holistic treatments and unfurl your body with yoga. In addition to twice daily drop-in classes, teachers from around the world host retreats throughout the season as well as yoga teacher training. 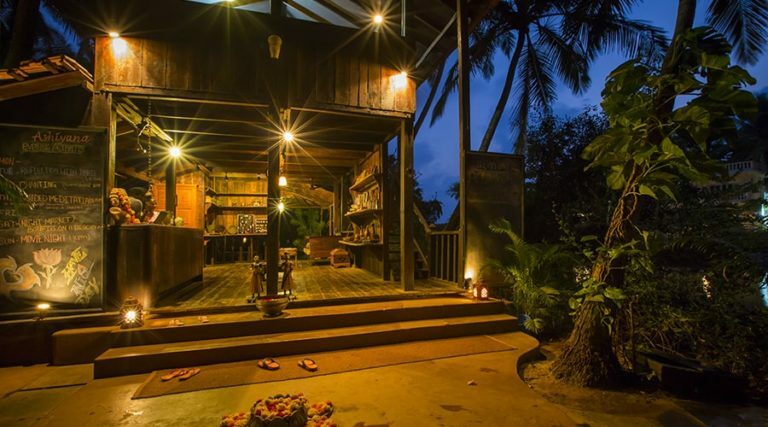 Ayurvedic detox programmes and holistic yoga therapy are specialities, while ecstatic dancing, swimming, chanting and music meditation are also on the menu. Whilst there’s much to do, chilling out is the only compulsory activity. The very reasonably priced treatments from authentic, generous and caring therapists. There is a vast range to choose from, so have a chat to the knowledgeable spa staff for guidance and to experience the best of Ashiyana, book as many as you can! The laid-back style and help-yourself meals add to the easy going and unpretentious feel of the place but this is not for those who expect a lot of service. This is India, where life runs at a slower pace and things can be a little rough around the edges. If you can fit one in your suitcase, take your own yoga mat or buy one at a shop in the local village – the mats provided are relatively rustic. 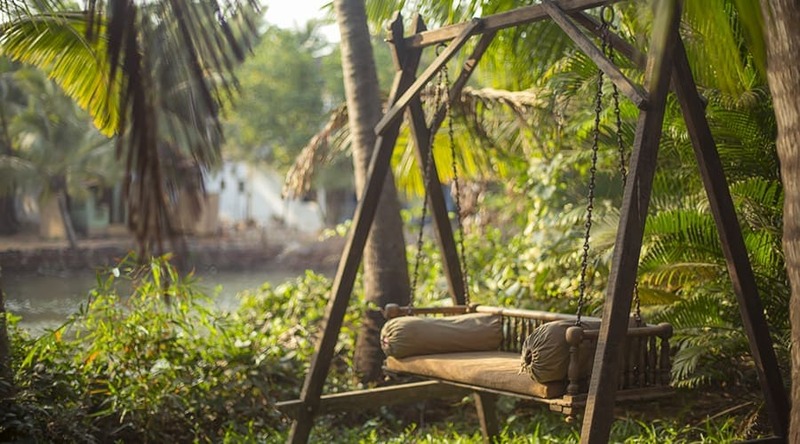 Frances Trussell reviews this hidden gem of a yoga retreat near Mandrem Beach in North Goa and finds loyal staff, well-taught yoga and life-transforming holistic treatments. Ashiyana is a fantastic destination for a yoga holiday with treatments galore, relaxing spaces and the nearby beach to enjoy. 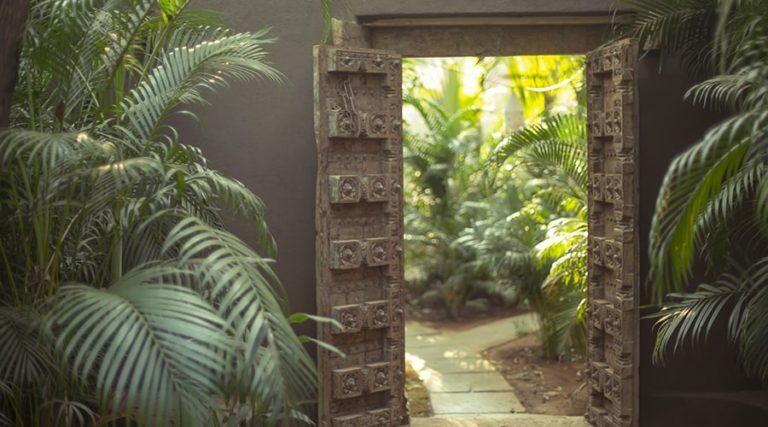 Whether you want just a little activity or a lot, a full Ayurvedic detox or fresh Indian feast, there’s something for you here. The twice daily drop-in sessions here are mixed level, cleverly crafted as such by confident and experienced teachers with a good range of options offered. Based on traditional hatha, classes are generally structured to begin by opening up energy channels followed by physical practice and then shavasna. The range of styles taught include vinyasa, dynamic, yin, Iyengar, restorative, flow and jivamukti. You could also book a dedicated yoga retreat, which are held throughout the season by teachers from around the world. If you are specific about the style of yoga you like or wish to move deeply into an area of practice a retreat format may offer you the best option. Teachers who come back each year include yoga therapist Adrianne Vos Burchart, Iyengar specialist Matthias Karcher and ecstatic dance teacher Lalita Marmeka. Retreats can be booked directly with Ashiyana, check out the website for what’s on when. One of Ashiyana’s signature specialities is Holistic Yoga Therapy. Individuals work with a therapist to develop an individualised practice based upon an assessment of physical and emotional state and breath patterns. Those completely new to yoga may find the 1-1 work at Ashiyana particularly helpful. 4 week intensive (200hr) Yoga Teacher Trainings are also held twice a year running October-November and February-March. 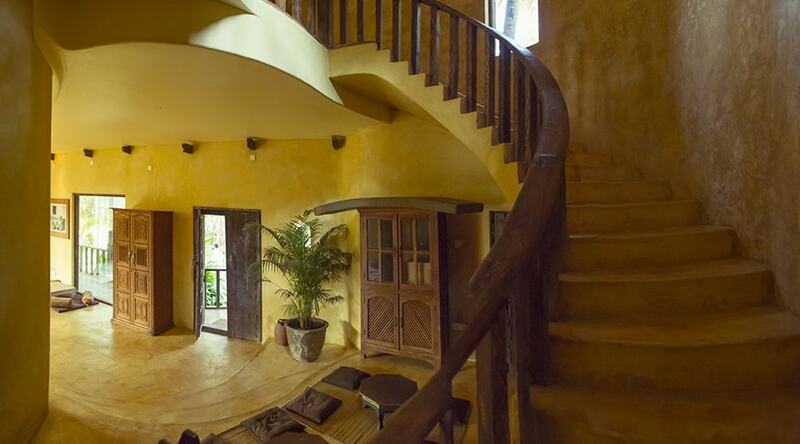 Many people come to Ashiyana specifically to consult with the in-house ayurvedic doctor, Dr Suvira. Following consultations to assess underlying health issues and determine body constitution based on your dosha balance you’ll be given tailored advice on diet, lifestyle, medicine and suggested treatments. These suggestions can be followed through on site with the therapies and detox plans available. 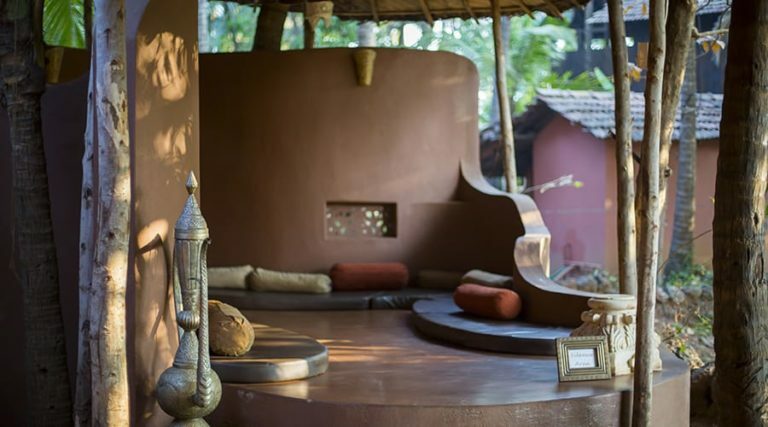 Many people follow one of the three Panchakarma (ayurvedic detox) programmes on offer, when, supported by the kitchen and treatment staff, you can be guided through seven or ten-day options to health, healing and rejuvenation. Find out more about ayurveda. There is a huge wealth of choice at Ashiyana’s spa. As well as ayurveda, all of the usual massage therapies you’d expect are here, from Swedish to deep tissue and Thai massage, as well as unexpected treats such as Zen Shiatsu, Soul Bodywork, Stress Pattern Release, Cranial Sacral Therapy, Rebirthing, Esalen Bodywork and more. There’s a steam room offered with certain treatments, but it’s not for general use. 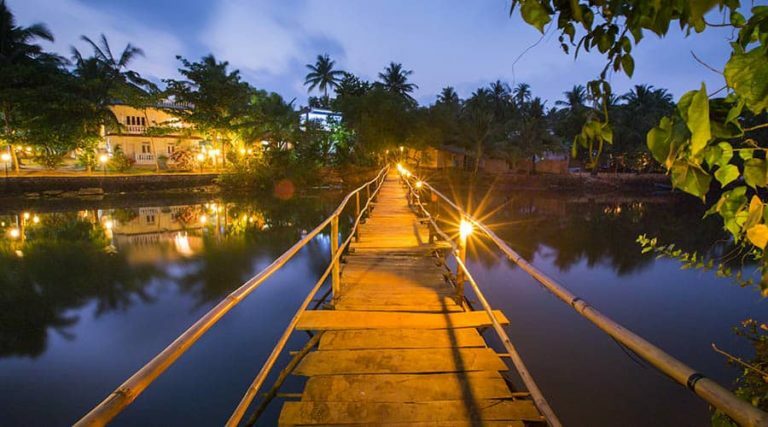 Over Ashiyana’s quaint wooden footbridge and past a series of huts on the sand dune you’ll quickly find yourself on the vast, largely unspoilt Mandrem Beach. The few local beach bars have food and drink for sale as well as sun loungers under the shade. You can swim in the sea or hire surf and kite boards to make the most of the modest waves. Early morning dolphin watching trips can be arranged by reception. Just 45 minutes away is Palolem Beach, known locally as “Paradise Beach” due to its long stretch of white sand, calm waters and night-time ‘silent discos’ where partygoers dance in headphones. 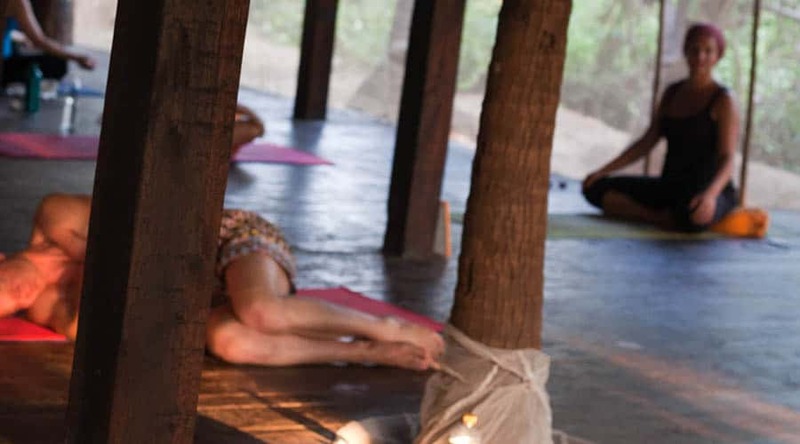 Each evening after dinner group sessions and workshops are on offer, such as Chanting, Meditation, Ecstatic Dance, Conscious Cinema and Yoga Nidra. The notice board at reception will keep you up-to-date with what to expect. These run most days apart from Saturday, when many guests head off to the local night market. Excursions to a spice farm or to Dudhasagar, the second largest waterfall in India, can also be arranged. Accommodation: Accommodation ranges from beach huts to luxury suites, all set within a well designed shady palm grove, giving Ashiyana its unique village feel and guests many options to choose from. 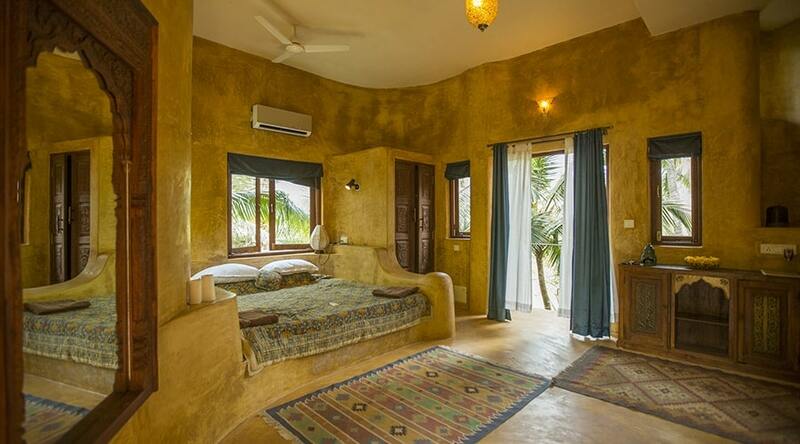 All rooms are en-suite and prices are inclusive of two meals a day plus drop-in yoga classes. Beach Huts: These cute woven huts are the most affordable option on-site and will give you an authentic Goan traveller experience. They are basic but clean and bright and come with a fan and mosquito net. Most have double beds with an option of twin bed and all are ensuite. Most are ‘over the river’, closest to the beach, joined to the main site via a wooden footbridge. 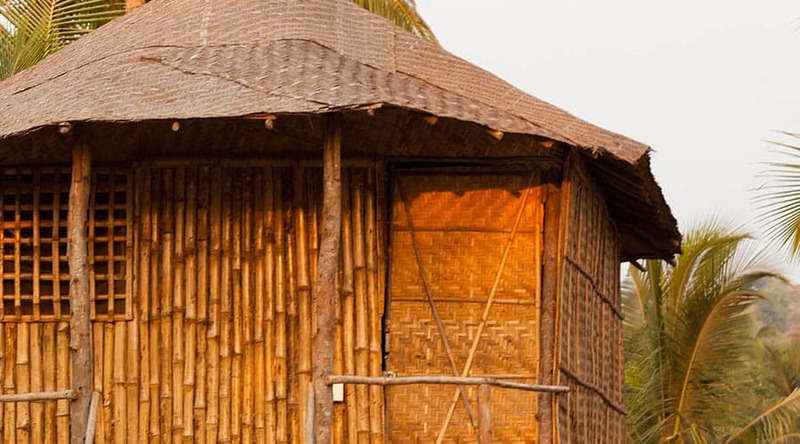 Houses: The Well Tree-House is a wooden house on stilts that provides some secluded luxury for one or two lucky occupants. Views from the private balcony stretch out to the fields and hills around. The shared Lake House adjoins this via an upper level walkway. This two-story stone house comprises three large double bed areas on each of the two floors. The rooms are spacious, and designed for individuals happy to share. 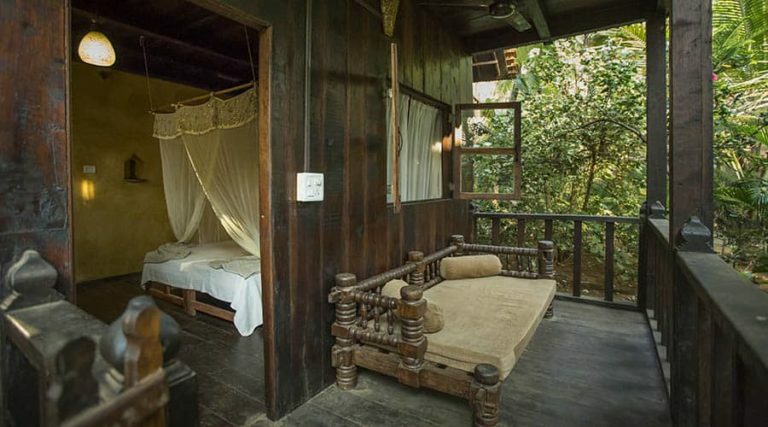 The Long Cabana is a shared, high ceilinged, wooden lodge with one single bed, one large double. 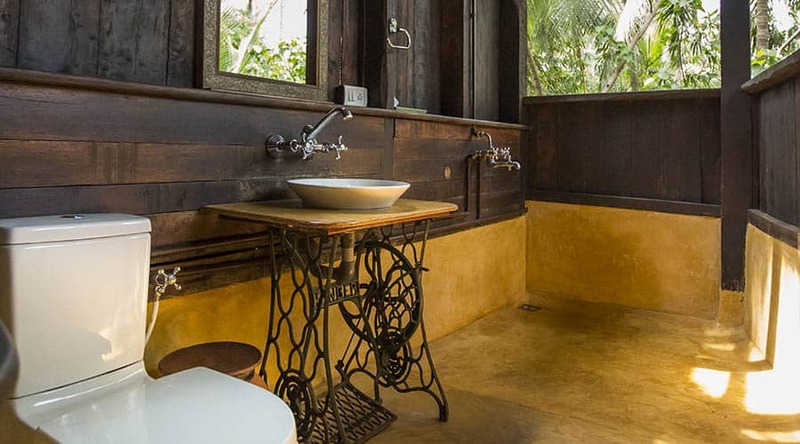 Eco lodges: There are three wooden eco-lodges, self-contained rooms with Moroccan inspired bathrooms and an Indonesian feel throughout. 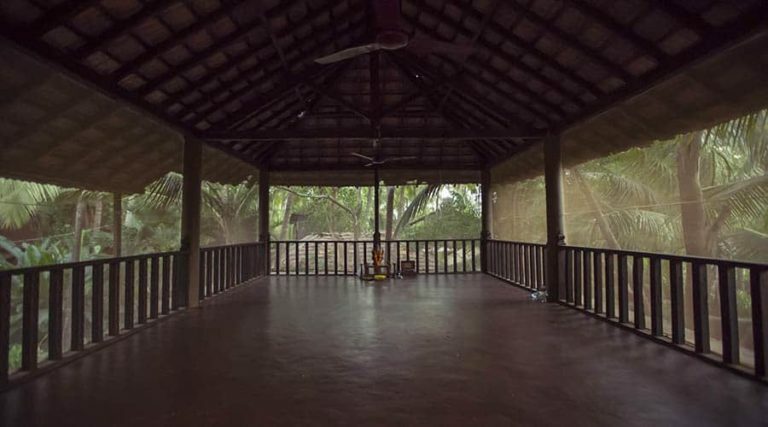 Two of the lodges sleep two people in a double bed or two single beds and have their own balconies with daybeds and views over the palm grove whilst ‘Adobe’ has a double bed suitable for a couple or single occupancy with it’s own garden area. 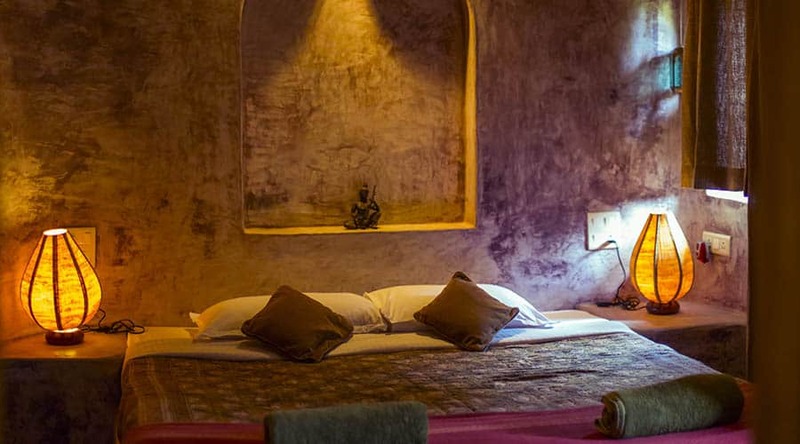 Luxury suites: The Raj Double Rooms, Raj Luxury and Shahi Suite are cool stone built rooms with individual charm, private outside spaces and antique furniture. Four are doubles and five are suites. 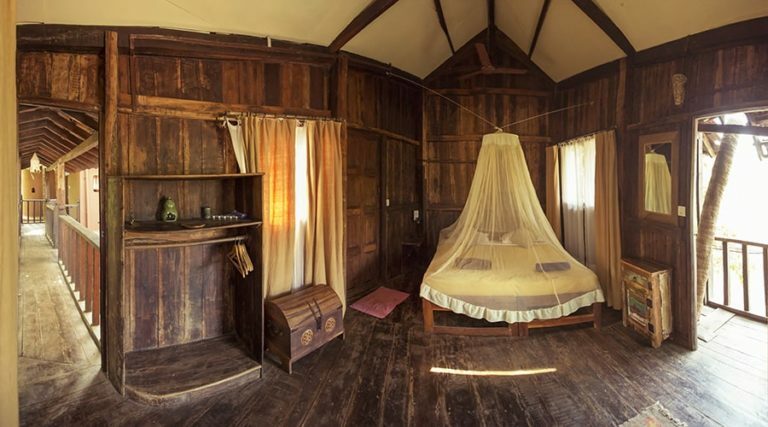 Look out for Moon Villa, which has a large double bed placed in the middle of the room, directly under a circular window in the roof, through which at certain times the moon can be seen. The most luxurious space, the huge Shahi Suite, offers fabulous views of the river. Other spaces to be: The garden’s well thought out design means a secluded spot is always to be found amongst the vast array of plants. Kick back into one of the many hammocks with a good book, nap on a daybed or rest on the swing seat that overlooks the river. Apply insect repellent before you leave Goa airport, the 1 ½ hour drive to Ashiyana is long enough to be thoroughly bitten if you’re susceptible. Check in is not until 2pm and if you arrive on an early morning flight, as many people do, it’s useful to have your swimsuit easily accessible so you can dive straight into your holiday. You can use the spa bathrooms for freshening up, have a swim and lounge by the pool, use one of the chill out areas or head to the beach. Ashiyana uses a lovely taxi firm local to them for transfers so just contact reception with your flight details. Ashiyana is open from the 1st of October until the 30th of April, with the monsoon rains arriving in May, after which it’s closed until September. Outside of monsoon season, Goa tends to have a consistent climate of hot and humid weather. December gets busy, so you’ll need to book ahead – high season is considered 20th December until 10th January, while both April and October are considered low season, and at all other times main season rates apply. 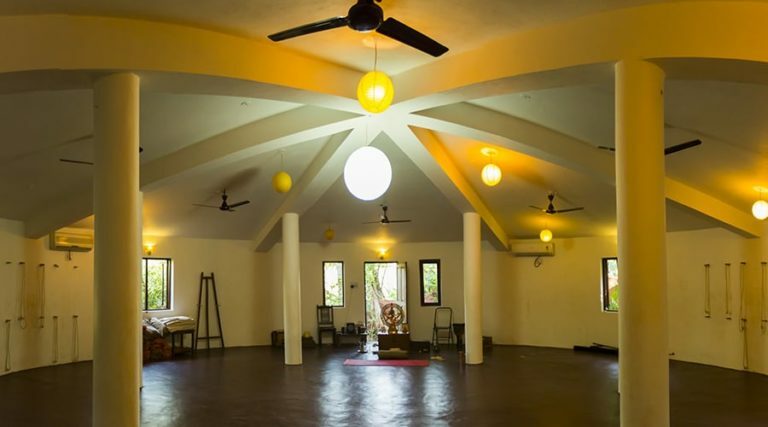 Yoga spaces: There are five main yoga shalas, a range of beautiful spaces set within the shady coconut palms. A particular favourite is the original wooden shala, which feels completely immersed in nature with its open mosquito-netted walls and natural locally sourced wood floor. Treatment spaces: Treatments take place in a collection of simple, unpretentious rooms within the spa area by the pool. Outside there are shady spots within the spa courtyard, including a gazebo where you can soak up oils, drink tea and rest in post-treatment bliss. Swimming pool: The chemical-free natural swimming pool surrounded by plants offers a lovely spot for a cooling dip. You might be lucky enough to compare your breaststroke with one of the resident frogs. Food is a tasty, colourful, sociable affair, self-served straight from the kitchen and eaten together outside around a large, long dining table. 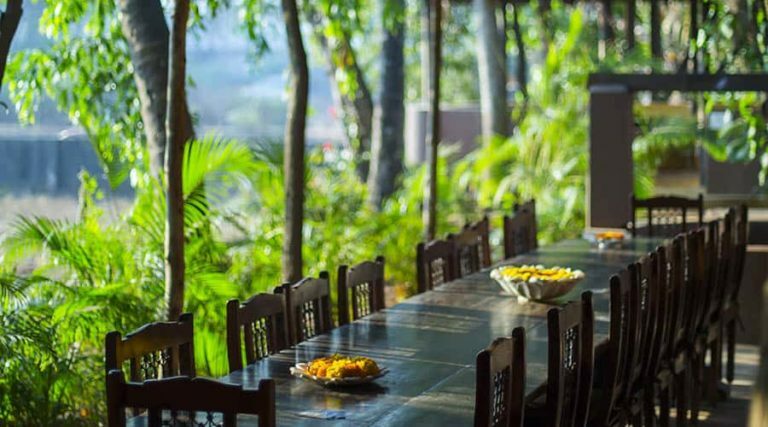 Those on yoga retreats tend to eat with their own groups at a couple of separate shaded eating areas whilst those on the yoga holidays attending drop-in sessions swap stories of treatments and travels, often joined by class teachers and spa staff. The food is vibrant, simple, plentiful fare, a fusion of Indian and Western Cuisine served twice daily. Chef Tek and his Nepalese team put together a brunch at 10am, with an abundance of fruits, porridge, an egg dish and smoothies. Evening meals usually consist of a varied rotation of fresh salads, curry, rice, dhal and desert, mainly vegetarian, with a fish option a couple of times a week. Drinking water, double filtered through reverse osmosis, is available throughout the day as well as on tap Masala Chai and hot lemon and ginger. There is no alcohol on site, however the beach bars just a short stroll away offer a range of local beers. All foods and materials are bought from local sources. There are a large number of, seemingly very happy, long term staff from the local community. Employees were keen to talk about the social equity ethos of Ashiyana. Food waste is recycled or composted. Guests are asked to use the handheld douches next to the toilet instead of toilet paper where possible.